The organ in the parish church of St Paul’s in Hong Kong had lain disused since it was damaged during the Second World War. Unable to have the entire instrument restored, the church had much of the pipework removed, leaving only the front pipes and casework, with the lower half of the casework turned into a music library. As part of an investment for the future ministry of the church, a Rodgers digital console was purchased and MPOS was asked to restore the remainder of the disused pipes. Additional pipe stops were added and incorporated into the digital organ. With a carefully designed blower and windchest system MPOS was able to give St Paul’s 11 ranks of speaking pipes, including the original Open Diapason (visible in the case) and Bourdon pipes. As always, the pipes and digital stops were voiced together so that the organ speaks as a single integrated instrument. 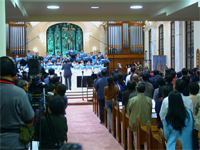 On Sunday 10th December 2006 the organ was blessed during a packed commemoration service led by the Bishop of Hong Kong and the congregation heard pipes speak that had last been heard 50 years earlier. Following on from the success of our installation in the Shenyang Conservatory of Music, Rodgers and MPOS were commissioned to build an instrument for the new recital room in the Central Conservatory of Music.